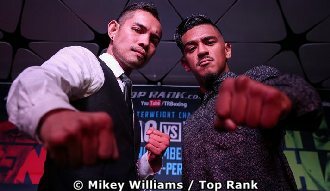 “The Filipino Flash” Donaire has advised fight fans “not to blink” when his title defense against unbeaten Jessie Magdaleno gets underway at the Thomas and Mack Center in Las Vegas on Sunday, Manila Time. Donaire told the Manila Standard that he “feels incredible. Strong, fast, smart” and added “you name it. Its all within me. It will all come out on Saturday” in Las Vegas.